Thanks to the many Italian immigrants who came to the United States at the turn of the 20th century, bocce ball has grown in popularity in various parts of the country. Like the Bay Area. Besides San Francisco’s North Beach, there’s Campo di Bocce in Livermore. Yesterday, Campo di Bocce was the site for the 13th annual Madden-Mariucci “Battle of the Bay” Charity Bocce Tournament. The event, which has raised more than $3 million for local and national charities, has become a place to see local professional sports team legends and broadcasters. Over the years, the local professional sports teams have sent contingents to this tournament to play against corporate squads. In recent times, some of these corporate teams have taken these matches seriously by recruiting experienced bocce players. 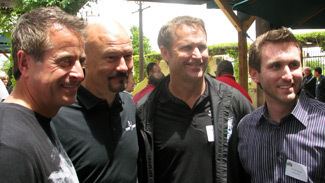 (left to right) Randy Hahn, Tony Bruno, Jamie Baker and Brodie Brazil at the 13th Annual Madden-Mariucci "Battle of the Bay" Charity Bocce Tournament at Campo di Bocce in Livermore, Calif. on June 1, 2011 (San Jose Sharks). The San Jose Sharks squad thought they had an edge this year. The team, captained by Television Play-by-Play Broadcaster Randy Hahn, featured an Italian (Assistant Equipment Manager Vinny Ferraiuolo, who played some bocce while growing up in Virginia) and an Italian citizen (CSN California Sharks Rinkside Reporter Brodie Brazil, a past participant in this tournament). Alas, the pisano influence didn’t help. The Sharks (whose squad featured Hahn, Ferraiuolo, Brazil, Kevin Compton and his wife Gayla from the team’s ownership group, Radio Color Analyst Jamie Baker and Equipment Assistant/Equipment Transportation Roy Sneesby) won one of their four matches. The lone win came against Team DYF/Welton, which had a few Warrior Girls (the Golden State Warriors cheerleaders) on their squad. (left to right) Steve Mariucci, Oakland Raiders Chief Executive Amy Trask, Kevin Compton and 49ers Legend Brent Jones at the 13th Annual Madden-Mariucci "Battle of the Bay" Charity Bocce Tournament on June 1, 2011 (San Jose Sharks). Even though the Sharks didn’t qualify for the tournament playoffs, everybody was a winner. Various wineries allowed everyone to sample their products. There was a huge dessert spread – including tiramisu, of course. There were also different kinds of pizza, pasta and antipasto for all to enjoy. But the big winners were the beneficiaries of the event: Juvenile Diabetes Research Foundation, Easter Seals Kaleidoscope, Northern California Special Olympics and Tri-Valley High School Football. As for next year, the going rumor is some Sharks “bocce scouts” have started bird dogging the bocce ball courts of the Bay Area looking for talent. For another look at yesterday’s festivities from a Sharks perspective, click here.